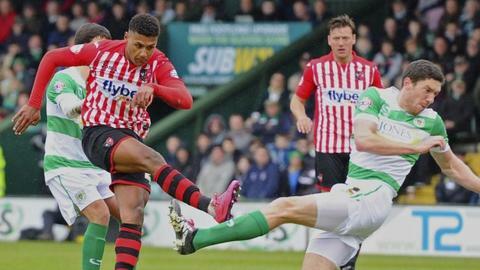 Exeter boosted their chances of a League Two play-off spot with victory at Yeovil Town. The Grecians took an early lead through Ollie Watkins' strike from the edge of the box, his eighth goal of the season. Jake Taylor almost made it two, hitting the post from distance before Yeovil's Francois Zoko and Jack Compton forced saves from goalkeeper Bobby Olejnik. Taylor sealed the points in the second half, scoring after Artur Krysiak failed to hold his initial shot. Exeter are now unbeaten in nine league games and level on points with Wimbledon, who currently occupy the final play-off position. Match ends, Yeovil Town 0, Exeter City 2. Second Half ends, Yeovil Town 0, Exeter City 2. Corner, Yeovil Town. Conceded by Robert Olejnik. Attempt saved. Jack Compton (Yeovil Town) left footed shot from the right side of the box is saved in the bottom right corner. Corner, Yeovil Town. Conceded by Jamie McAllister. Substitution, Exeter City. Arron Davies replaces Jake Taylor. Substitution, Exeter City. Alex Nicholls replaces Ollie Watkins. Corner, Yeovil Town. Conceded by Jordan Moore-Taylor. Ryan Dickson (Yeovil Town) wins a free kick in the defensive half. Liam Walsh (Yeovil Town) wins a free kick in the defensive half. Substitution, Yeovil Town. Ryan Bird replaces Liam Shephard. Corner, Exeter City. Conceded by Liam Shephard. Goal! Yeovil Town 0, Exeter City 2. Jake Taylor (Exeter City) right footed shot from the right side of the six yard box to the centre of the goal. Attempt saved. Harry Cornick (Yeovil Town) right footed shot from the left side of the box is saved in the top centre of the goal. Corner, Yeovil Town. Conceded by Craig Woodman. Foul by Ollie Watkins (Exeter City). Attempt saved. Jayden Stockley (Exeter City) right footed shot from outside the box is saved in the bottom right corner. Substitution, Yeovil Town. Harry Cornick replaces Tahvon Campbell. Lee Holmes (Exeter City) is shown the yellow card for a bad foul. Foul by Liam Shephard (Yeovil Town).